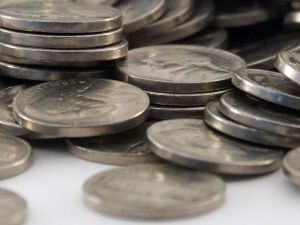 Did you know that a few Jefferson nickels, the 5-cent coin that Americans have seen in their pocket change since 1938, are actually considered scarce? Believe it or not, the Jefferson nickels series contains a few coins with less than 10 million total struck — a low enough number which, for a popularly collected series like Jefferson nickels warrants these particular dates to be considered relatively scarce. Making matters all the better is that these rare nickels actually can be found in circulation — with a bit of luck, of course! So, which Jefferson nickels are considered relatively scarce, with mintages of less than 10 million? Except for proof issues — with numbers under 10 million each but quite common in proof sets — here the 9 scarcest, regular-issue (produced for circulation purposes) Jefferson nickels. The Denver issue from the first year of the Jefferson nickel series, only 5,376,000 of these coins were minted. The 1938-D starts at a price of about $1.50 for an average-circulated Jefferson nickel. The San Francisco mint churned out only 4,105,000 first-year Jefferson nickels, among the 3 scarcest coins of the regular-issue Jefferson nickels. The 1939-S has a base price tag of around $2.50 for a typical, circulated Jefferson nickel. Coming in as the second scarcest regular-issue Jefferson nickel, the 1939-D is among the top of Jefferson nickel collectors’ wish lists. This piece, has risen in value a bit over recent years, with a low-end price tag of about $6. Though not quite as scarce as its Denver cousin, the 1939-S is still a coin that is very difficult to locate in circulation and does cost a slight premium over other regular-issue Jefferson nickels in average-circulated condition. With a mintage of 6,630,000 the 1939-S Jefferson nickel typically costs about $1.50 in decent circulated condition. With some 9,716,000 being churned out, the 1949-S nickel is among the least scarce of the nickels listed here, but still under the 10,000,000 threshold and, thus, among the hardest-to-locate Jefferson nickels in the entire series. The 1949-S Jefferson nickel can be had for about 75 cents in circulated grades. 1950 was a pretty lean year for nickel production. Only 9,847,386 1950 nickels rolled out of the Philadelphia mint, making the 1950 Jefferson nickel a coin worth looking for — and one that is certainly needed if you are completing a Jefferson nickel series collection. The 1950 Jefferson nickel can be purchased for around $1 in middle circulated grades. Every good coin series has its “key” coin. The Lincoln cents have the 1909-S V.D.B., the Mercury dimes have the 1916-D, and the Standing Liberty Quarter series would not be the challenge it is without its 1916 key. Which one coin is the most sought-after Jefferson nickel? None other than the 1950-D Jefferson nickel. That’s right, a modern-day “rarity,” with just 2,630,030 produced. A popular key coin ever since it first was released, causing people in mainstream America to look for and snap up these 1950-D Jefferson nickels, this coin at one time cost many hundreds of times its face value in uncirculated condition. While the fervor has since quieted around the 1950-D Jefferson nickel since its peak in popularity decades ago, this is still a coin that has people in the Jefferson nickel and modern coin communities buzzing. Because it was saved in bulk quantities early on, most 1950-D nickels you find in dealers’ cases will be uncirculated. However, worn 1950-D Jefferson nickels certainly exist, and it is not at all impossible to even come across one in your change today. To buy a 1950-D Jefferson nickel will set you back about $15 or so in circulated grades, but only around $20 in uncirculated — remember, many were saved from day one. Not nearly as scarce as the 1950-D but still a toughie, the 1951-S Jefferson nickel comes in with a mintage of 7,776,000 — still a coin which will be difficult to find in circulation. The 1951-S Jefferson nickel costs around 75 cents to purchase in average-circulated condition. With 8,266,200 minted, the 1955 nickel demands a good eye and a bit of luck to spot in circulation. It also commands a slight premium over other average-circulated, more common Jefferson nickels, starting at around 50 cents to purchase a circulated 1955 Jefferson nickel. As you can see, even the scarcest of the Jefferson nickels are not at all cost-prohibitive for the average coin collector — making Jefferson nickels a very good series to assemble for most anyone. Incredibly, these rare nickels can, on occasion, still be found in circulation. So with a keen eye, patience, using a fine tooth comb through many rolls of Jefferson nickels, and keeping your eyes on your change… you just may be able to complete a series of regular strike Jeffersons without paying more than face value! However, if you are like many people, you may instead decide to buy these rare nickels — since they’re so difficult to find. The good part: prices are currently very affordable.